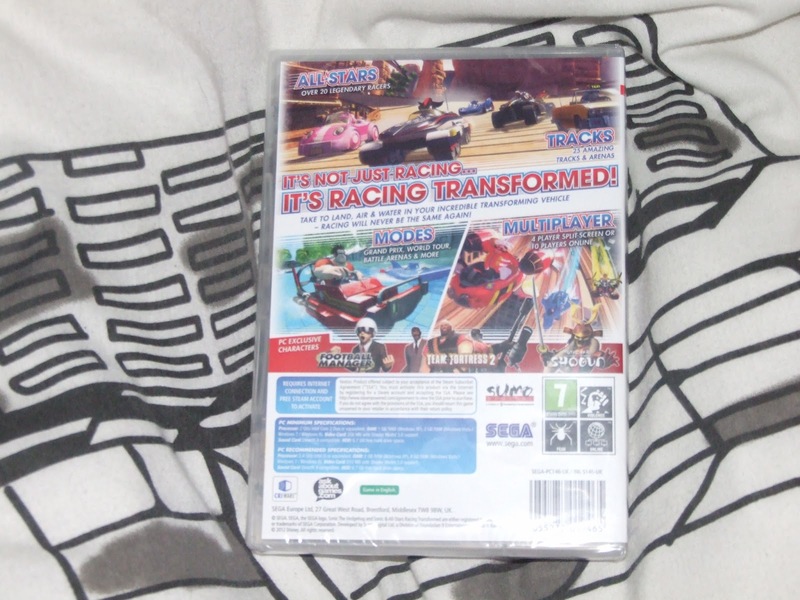 Sonic and All Star Racing Transformed [PC] – Download Only? 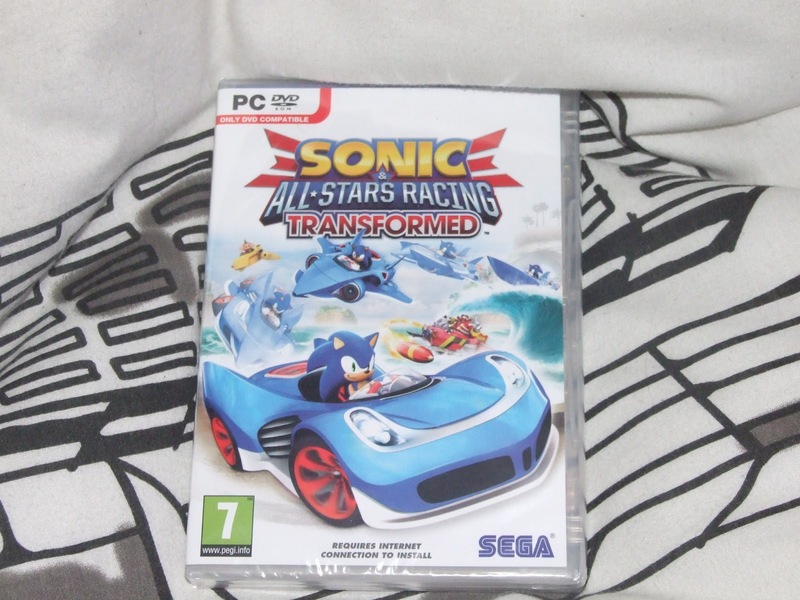 Just a quick updatem remember when Sonic and All Star racing transformed was first announced, they named all of the platforms it would be on, and they mentioned “PC Digital Download” instead of just “PC”, suggesting that they would be no retail version? For those who don’t know me, I much prefer retail copies, I just don’t like digital downloads at all, so this really p*ssed me off! Despite this, Amazon had the PC retail version available for pre-order, so I thought I’d pre-order it, in hopes that Sega do make a retail copy. Months after the game was released, I got an email saying my pre-order was dispatched! Either it was a mistake made by Amazon, or Sega have finally made a physical PC version. The next day, it arrived! YES! I can finally try out Racing Transformed! I loved the original, great fun, I hope this one will be just as fun! I’ll try out out later on today, because I have my Driving lession today, and I’d guilty if I didn;t do something to my Rossies 3D project, but I’ll definitely try it today! Before I begin, chances are, I won’t have anything to report on next months Retro Diary, yeah, I was thinking of making on, but one cousin is Living in Australia for a month, and the other is too busy with his job, and they’re the only one who played games with me, so I’d have nothing to report. Okay, this is just a small rant, just to get this off of my chest, I’m very sure many will disagree with me on this subject, but I have to get this out there, I can’t contain it anymore. Why? Why are people so obsessed with Smart Phones, to me personally, they’re boring, inconvenient, useless and overpriced. With the exception of a few friends, eveyone I know checks their phone every 5 seconds, or are just completely glued to the screen, it doesn’t matter what situation they’re in, their phone is always their priority. When they’re talking to friends and family, on their phones, when a good TV show or a film is on, they’re on their phones, the apocalypse is happening, they’re on their f*cking phones! In fact, I wouldn’t be the slightest bit surprised if someone is viewing this on their phone! I see people on them everyday, on the Bus, on the Train, in College, etc. and I always hear that annoying ringtone that pretends to be an old phone, you guys know what I’m talking about, and that annoying sound when someone gets a text message! urgh! I’m sick and tired of hearing it! I actually once saw somebody on their Iphone in front of a PC! Why don’t you use the f*cking PC!? Phones to me, are just watered down versions of PCs, it has half the stuff a PC has, but crappy. What on earth do they do on them!? Are they on Facebook? Twitter? That’s all I see on them, surely they must get bored of them, I mean don’t get me wrong, Facebook and Twitter are good, but I check them like one or twice a day, if even that, not every 5 seconds! Even in the cinema, someone I knew had their phone under their jacker secretly on it while the film was on, disgraceful! I mean come on! You can live a little without your phones, you did years ago, why are you so reliant on them now!? The only use I could have with an Iphone or Android, is the ability to go online outside your home, for example, I find a game in the store, great condition, price seems good, I could go on Amazon and eBay and compare prices. Nope, as far as I’m aware, you need a router or wi-fi to go online. Purpose: Defeated! I wouldn’t be surprised if the phones eventually turned everyone into zombies, and caused a zombie outbreak in the world. Can anyone last 5 seconds without checking Facebook or Twitter on their phone!? Put them the f*ck down, and actually do things with other people! It’d be worth it in the end, trust me! That concludes my rant! I’m glad it’s out, I feel slightly better now! Okay, before I start off, I’ll only be doing these blongs monthly now, and with less detail, because I’m busy with college and Rossies 3D. but hey, monthly is better than never, right? On the 5th of January, me and my cousin, Steven, played a few games of Robot Arena 2 vis GameRanger, it works great, neither of us have had problems with it, if you want to play Robot Arena 2 with a friend online, GameRanger is the way to go! The interesting thing about this night was that we didn’t say a single English word to each other, we both spoke Scots the entire night! There you go, not much, but I suppose it’s better than nothing, right?